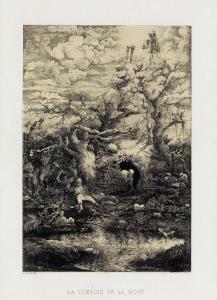 Find artworks, auction results, sale prices and pictures of Rodolphe Bresdin at auctions worldwide. RODOLPHE BRESDIN Le Bon Samaritaine. 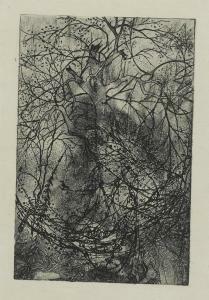 Lithograph on cream wove paper, 1861. 560x440 mm; 22x17 3/8 inches. Préaud's first state B (of 2), with the "white bird" lower left and with the black "ink smudge" on the left leg of the striped-tail monkey on the branch lower right, before the transfer to another stone in 1868. Edition of approximately 300 lifetime impressions with these characteristics. Printed by Lemercier, Paris. A brilliant, early and richly-inked impression of this very important lithograph with extremely strong contrasts and all the fine details distinct. Lifetime impressions, such as the current work, are exceedingly scarce; we have located only 8 other such impressions at auction in the past 30 years. There is also a more common, posthumous edition (printed after the transfer of the subject to another stone). Despite his technically complex and highly imaginative printed work, the self-taught Bresdin (1822-1885) remained in obscurity and penniless throughout most of his career. Disregarded by many of his contemporaries due to his eccentricity, he was referred to as "le chien-caillou" ("the stone dog"). Some critics and artists, however, recognized and respected his genius, including Victor Hugo and Charles Baudelaire (Bresdin was also Odilon Redon's mentor, see lots 129-136). One of the most visionary printmakers since Rembrandt, he was clearly a devotee of the master's work, evidenced both in his early engravings and lithographs of intimate interior genre scenes and by a comparison of the current work. 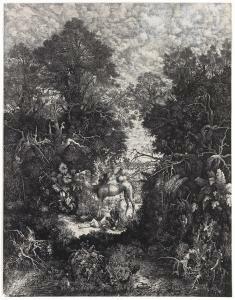 Like Rembrandt's The Angel Appearing to the Shepherds, etching, 1634 (see below), Bresdin's tour-de-force lithograph shows a dark landscape rendered by a complex system of densely overlapped lines and varied tonalities. Van Gelder 100; Préaud 29. 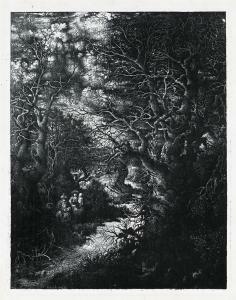 RODOLPHE BRESDIN (1822-1885) Branchages etching, circa 1880, on cream simili-Japan paper, a fine impression of this uncommon print, from the posthumous edition of fifty before steel-facing and the reduction of the plate, with wide margins, in very good condition Plate 172 x 122 mm., Sheet 330 x 210 mm. RODOLPHE BRESDIN La Fuite en Égypt. Lithograph on Chine appliqué, 1855. 228x175 mm; 9x7 inches, full margins. 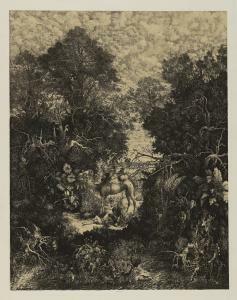 Artist's proof, possibly unique, between Préaud's first and second states, with the image slightly reduced at left and right, but before the clarification of the stream area directly under Joseph. A brilliant, well-inked and luminous impression with all the fine details distinct. Van Gelder 85. RODOLPHE BRESDIN La Comédie de la Mort. Lithograph on Chine jaunâutre appliqué, 1854. 225x145 mm; 8 7/8x5 3/4 inches, full margins. The sixth printing of 1861, with the title in rustic letters and the inscriptions lower margin. A superb, dark impression with all the details distinct. Van Gelder 84.